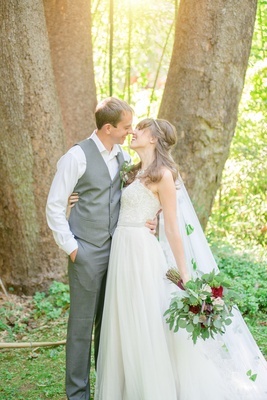 Many brides and grooms think of their wedding day as a fairy tale they get to live out with their beloved by their side. 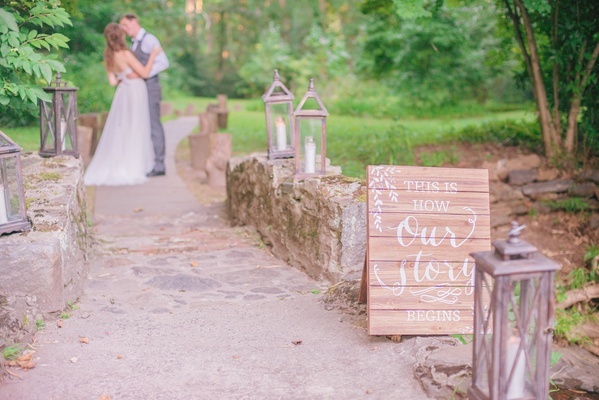 While some elect to host more formal nuptials, there are a great number that search for a more pastoral motif for their big day. 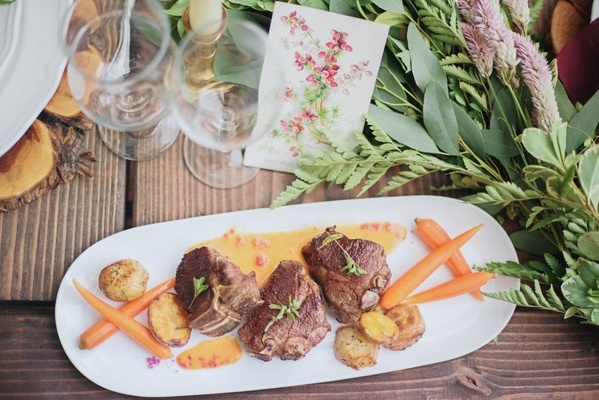 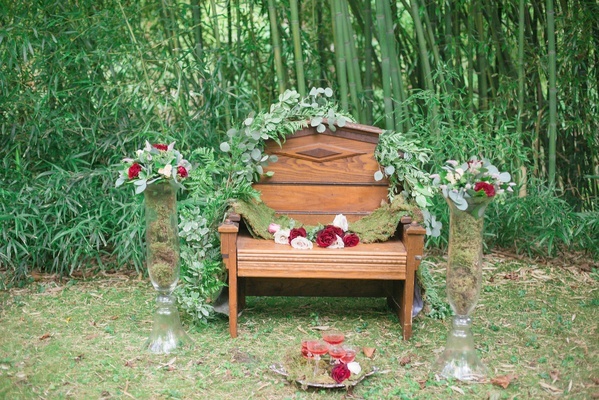 As we see rustic weddings rise in popularity, there are far more garden or forest concepts being incorporated in ceremonies and receptions alike. 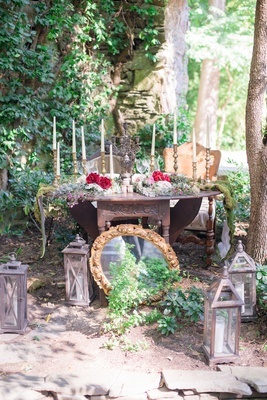 In the construction of this Pennsylvania wedding styled shoot, coordinators worked with the natural setting in order to create the pinnacle of whimsy for the model couple’s makeshift vows. 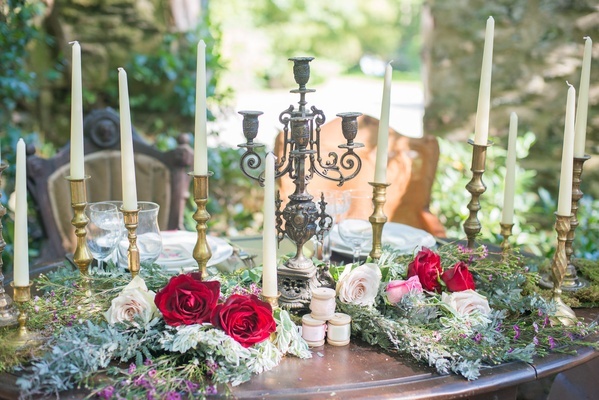 The entire shoot was inspired by a Celtic wedding, with each element specifically selected to reflect some representation of the culture. 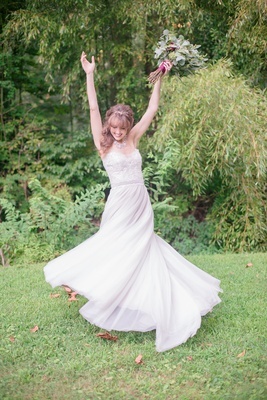 The model bride donned an A-line gown with a delicate lace bodice featuring a sweetheart neckline and a ribbon belt to exude a simple elegance in the alfresco setting. 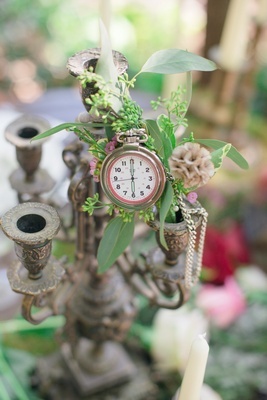 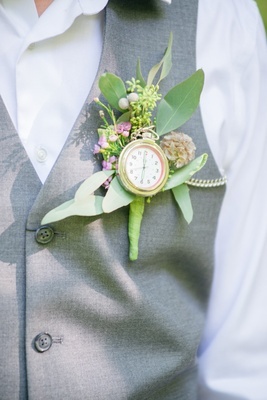 Her groom sported a grey suit vest – over a white collared shirt – and matching slacks to coordinate with the understated nature of the gown, but added an interesting boutonniere to his ensemble, which feature foliage, small blooms, and a pocket watch. 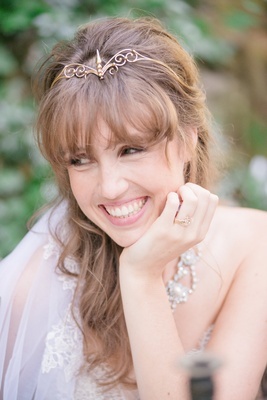 The bride also wore a gilt piece around the crown of her head, a stunning pearl necklace, and a claddagh ring, which is traditional in Irish culture. 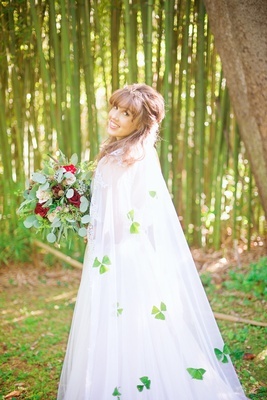 A flowing cathedral veil bedecked with a smattering of shamrock appliqués fell behind her as she walked, carrying a rustic bouquet filled with red and blush flowers surrounded by greenery. 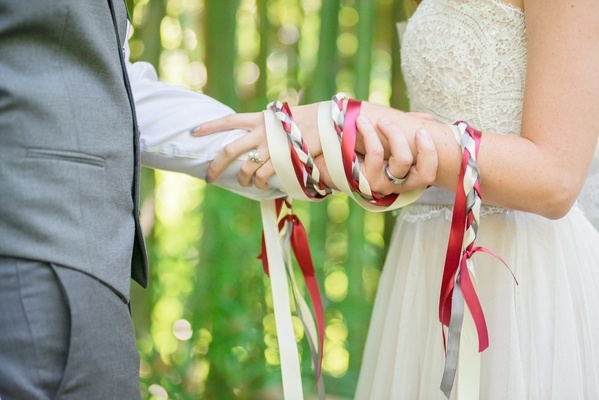 For inspiration, the bride and groom demonstrated a hand-fasting ceremony with a braided silk ribbon tied around their left hands, binding them together. 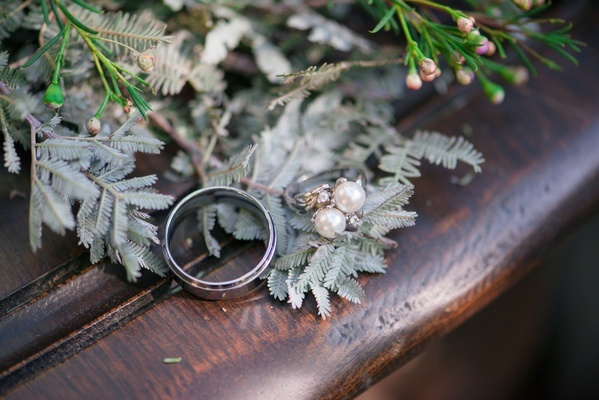 This part of the vows is when the couple quite literally “ties the knot” and officially joins as husband and wife. 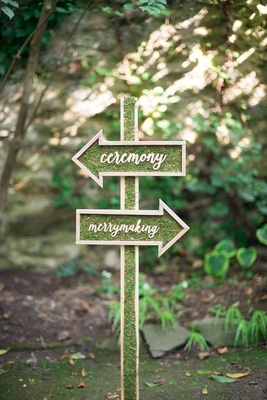 Following the service, a guest would take direction from the bespoke sign featuring extensive verdure denoting the direction of “merrymaking,” or the reception. 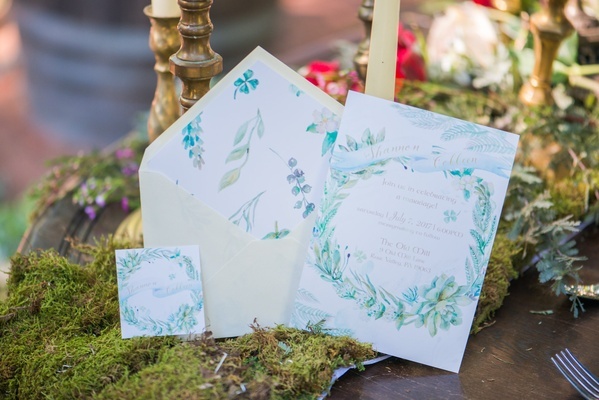 Upon entrance into the celebration space, watercolor invitations of green and blue were sweetly displayed on a bed of moss atop a rustic sweetheart tablescape. 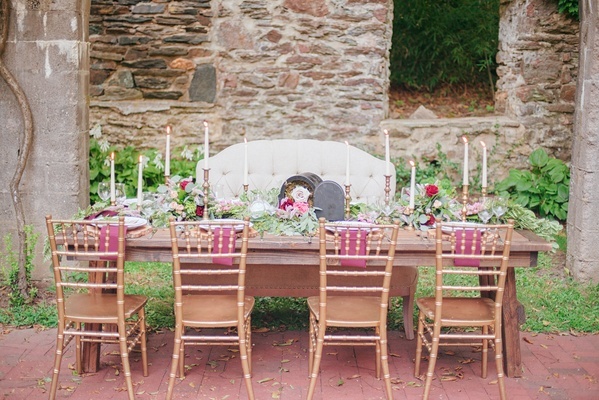 The wooden table was bare of linens and featured a plethora of loose roses and other flowers atop natural sprigs. 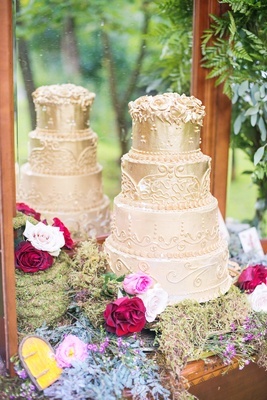 Gold candles were woven throughout the display, and two white china plates sat at each table setting. 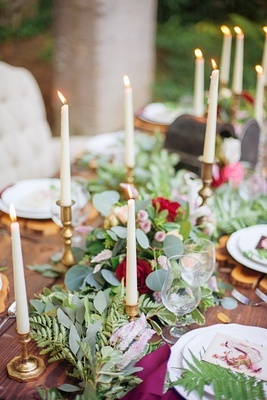 The tablescape for friends and family of the newlyweds was designed in a similar image: a wood surface with a long floral table runner made up of the same blooms and flanked by gilt candles. 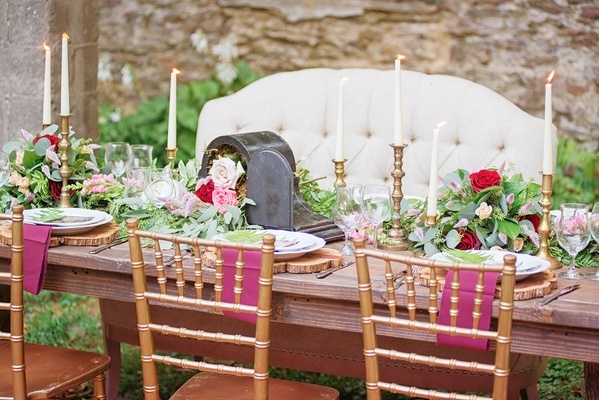 However, this long table featured an added vintage mailbox placed at the center, as well as linen marsala-colored napkins at each place setting topped with a menu showcasing the culinary options for the evening. 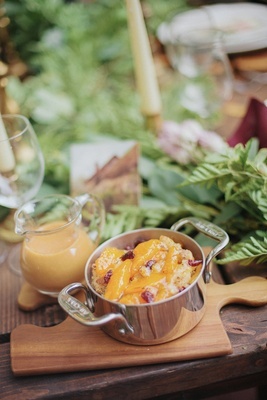 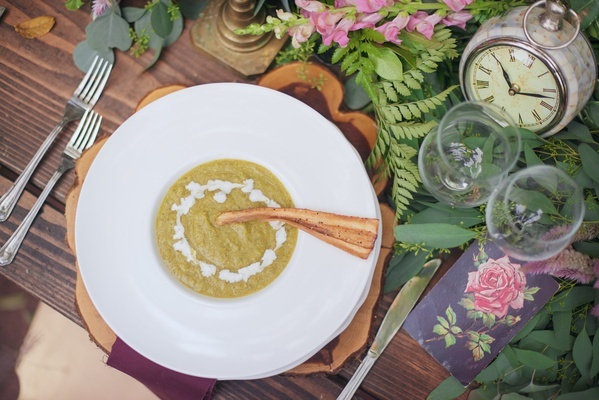 The cuisine coordinated perfectly with the Irish concept, as the menu included Guinness-marinated lamb, Irish bread pudding, and colcannon soup. 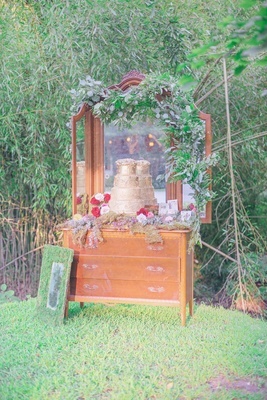 When it came time for dessert, attendees could find a vintage wooden dresser covered in vines and bold blossoms displaying a four-tiered gold confection with intricate frosting designs. 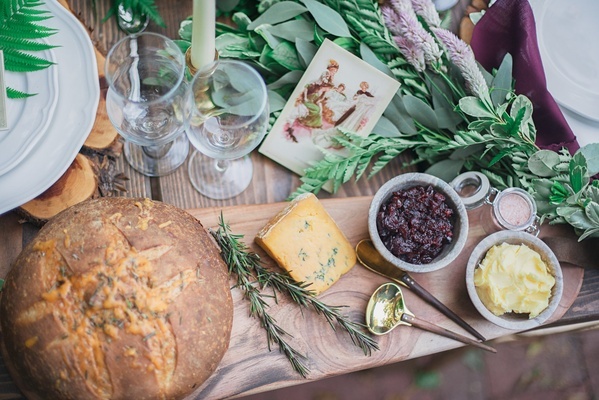 If revelers were to become tired over the course of the festivities, a rustic wooden bench adorned with the same winding vines and perennials could be found nearby. 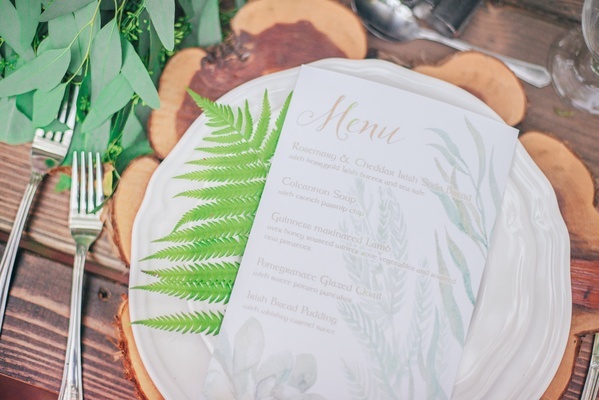 Overall, each carefully crafted element of this shoot evoked a strong sense of ethereal bliss from which any bride or groom can draw inspiration.